Boxing fans will have an opportunity to socialize with Boxing Hall of Fame VIPs during Friday night’s title fight at Turning Stone. Boxing celebrities expected at the fights include Vitali Klitschko, Mike Tyson, Miguel Cotto, Riddick Bowe, Marvin Hagler, sports broadcasters Steve Albert and Jim Gray and more. It’s fight week and the exciting days leading up to International Boxing Hall of Fame Weekend in Central New York. In partnership with the Boxing Hall of Fame, Turning Stone announced today boxing fans will now have an opportunity to rub shoulders with some of the biggest names in boxing. Boxing VIPs expected to be in attendance on Friday night include Vitali Klitschko, Mike Tyson, Miquel Cotto, Riddick Bowe, Marvin Hagler, Erik Morales, Winky Wright, Marco Antonio Barrera, Michael Carbajal, Gerry Cooney, Michael and Leon Spinks, Christy Martin, Sergio Martinez, James Toney, “Irish” Micky Ward, and more. For the first time ever, Turning Stone will offer this unique boxing fan experience for guests who purchase tickets for Golden Boy Promotions’ Diego De La Hoya vs. Jose Salgado on Friday night. For $35 (plus the purchase of a ticket), guests will receive access to the Hall of Fame Lounge, where boxing VIPs will be socializing throughout the night, as well as a commemorative t-shirt and poster. De La Hoya vs. Salgado is a 10-round showdown on Friday, June 8 where De La Hoya will defend his NABF and NABO Super Bantamweight Titles, presented by Golden Boy Promotions and Don Chargin & Paco Presents. Tickets start at only $39 and are available by calling the Turning Stone Box Office at 315.361.7469 or online at Ticketmaster. For more information about Friday night’s Golden Boy Boxing on ESPN, click here. The following night, Saturday, June 9, Turning Stone and the International Boxing Hall of Fame will host the Banquet of Champions in the Event Center, where guests will have another chance to mingle with the most iconic legends in the world of sports. The 2018 Hall of Fame Inductees will be honored during the Banquet including heavyweight champion Vitali Klitschko, four-division world champion Erik Morales, light middleweight champion Ronald “Winky” Wright and sports broadcasters Steve Albert and Jim Gray. Doors open at 7:00 p.m. and the program will start with introductions at 7:45 p.m., followed by dinner at 8:00 p.m. Tickets are $135 and can be purchased by calling the Boxing Hall of Fame at 315.697.7095. Additional International Boxing Hall of Fame Weekend events include Sunday’s Parade of Champions at 1:00 p.m., with Arizona Cardinals wide receiver Larry Fitzgerald as the Grand Marshal, and the Hall of Fame Induction Ceremony at 2:30 p.m. For more information about the entire weekend of events, please click here and here. In October, Turning Stone and the International Boxing Hall of Fame announced a five-year multifaceted partnership to spotlight the entire region, garnering national attention and boosting Central New York tourism. 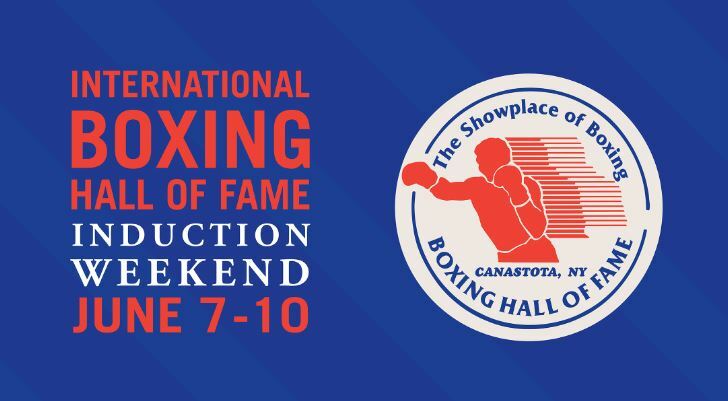 The program includes a series of nationally-televised boxing events at Turning Stone, culminating every year in June with an elaborate and bigger-than-ever International Boxing Hall of Fame Weekend celebration.